Vehicle-to-grid – How Close is SA to Implementation? You are here: Home / Business / Vehicle-to-grid – How Close is SA to Implementation? 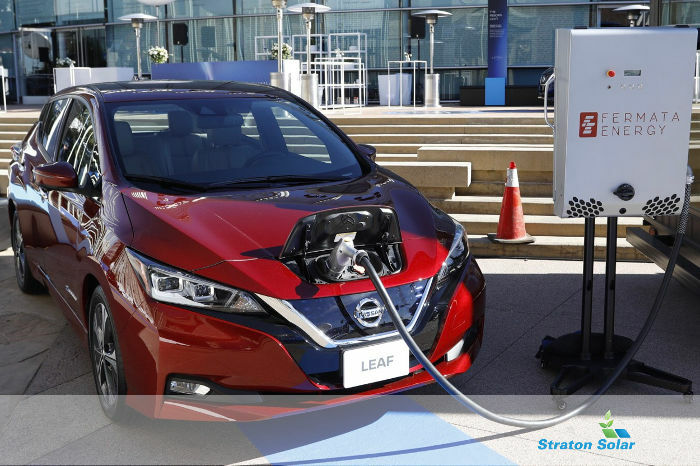 The Nissan Energy Share initiative leverages bi-directional EV charging technology. In addition to potentially eliminating load shedding and the reliance of the grid on peaking plants, vehicle-to-grid technology has the capability to balance the grid as well as flattening out the peaks and troughs when it comes to energy demand. Vehicle-to-grid (V2G) is a system in which plug-in electric vehicles, such as battery electric vehicles (EV’s), plug-in hybrids (PHEV) or hydrogen fuel cell electric vehicles (FCEV), communicate with the power grid to sell demand response services by either returning electricity to the grid or by throttling their charging rate. V2G storage capabilities can also enable EVs to store and discharge electricity generated from renewable energy sources such as solar and wind, with output that fluctuates depending on weather and time of day. Peak electricity demand in South Africa hovers around the 27 Megawatt mark. Stage 4 loadshedding allows for 20% of the load to be shed which would equal 5.4 Megawatts or 5 400 kilowatts. Consider this – if we had to load shed and were able to purchase electricity from 5 400 V2G cars connected to the grid it would mean buying 1 kilowatt per vehicle. NOTE – this is simplistic as battery strength is measured in kilowatt hours so the amount that the grid would buy from V2G EV’s would vary depending on for how long peak demand (or in Eskom’s words; “‘Grid Strain’) continues for. To control all this we would have to roll out Smart Meters at a greater rate than at present – SA has tens of thousands installed in contrast to the UK which has over 11 Million installed. The UK Government has committed to ensuring that every home and small business in the country is offered a smart meter by the end of 2020. The Smart Metering Programme aims to roll-out over 50 million smart gas and electricity meters to all domestic properties and smart or advanced meters to smaller non-domestic sites in Great Britain – impacting approximately 30 million premises. The lack of a National plan to utilise, incentivise and indeed recognise alternative energy. Our National Grid is struggling to make ends meet on the back of a huge backlog to supply electricity to millions of people who never had access to the grid. Many people in our country benefit from the Assistance to the Poor (ATTP) programme granting them free electricity on a sliding scale – in the Nelson Mandela Bay Metropolitan Municipality more than HALF of the households benefit from some free services. A smart meter records consumption of electricity and communicates the information to the electricity supplier for monitoring and billing. Smart meters typically record energy hourly or more frequently, and report at least daily. Smart meters enable two-way communication between the meter and the central system. The Mitsubishi OUTLANDER PHEV was the first car in the Netherlands to balance the Dutch energy network using V2G-technology. Every Mitsubishi OUTLANDER PHEV and its battery have the built-in capability to utilize a V2G charge point. During 2015 a two-year V2G study with Southern California Edison and the California Independent System Operator (CAISO) wholesale electricity market at Los Angeles Air Force Base was commissioned. The project was funded by the U.S. Department of Defense. The project comprised 32 electric and hybrid vehicles, including Nissan Leaf sedans, Ford F-Series trucks and VIA Motors VTRUX vans. The cars provided frequency regulation, which is the constant second-by-second adjustment of power to maintain grid frequency at 60 Hz to ensure stability, to the CAISO wholesale electricity market. In October 2018 Nissan’s Leaf became the first electric vehicle (EV) to secure regulatory approval as an energy backstop for Germany’s electricity grid. Nissan said it would initially target corporate clients with fleets of more than 60 electric vehicles, adding that services based on V2G technology would be offered in Germany from next year onwards. As a country with only one time zone and limited 24 hour sunshine it would make sense to get the buy in from all EV owners and, for that matter, Hybrid (with batteries) Solar Power owners to supply electricity (and be paid) to the grid when needed.